Yesterday was “Terrible Traffic Tuesday” – the dreaded day after Labor Day when everyone in the region hits the rush hour roads after the summer stretch of vacations. 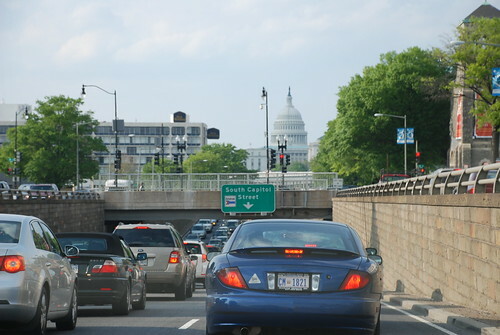 However, some good news came out yesterday for commuters from the Metropolitan Washington Council of Governments. While it may not be as beltway-shattering as new construction projects or Metro passenger records, it’s still pretty important. Yesterday, the council unveiled their newly revamped Commuter Connections website. The new site – which was quietly launched last month for last-minute testing – allows users to create and manage their personal profiles directly. This allows people to easily find carpools, van pools, ride shares and other commuting options nearby that are desperately needed by some to combat higher fuel costs. CC basically connects people to other commuters who live and work near them. One of the better benefits of the system, however, is the Guaranteed Ride Home program, which provides carpoolers and transit users a ride home in case of an emergency or if they’re required to work unscheduled overtime that would force them to miss their ride. While limited to four times a year, the service is still a great benefit to many commuters, especially those with families. Additionally, the site provides detailed information about all sorts of transit options, park-and-ride lots and locations and even teleworking centers along various routes. All-in-all, the system gives a myriad of options and information for area commuters so that better cost-saving decisions can be made. With rising congestion, escalating numbers of Metro riders, new HOV / HOT lanes in the works and other commuting obstacles in the area, the Commuter Connection’s new look and system is a great tool at the right time. So. Anyone need a lift?